The turn of the calendar always brings some changes, and the Penn Stater is no exception. 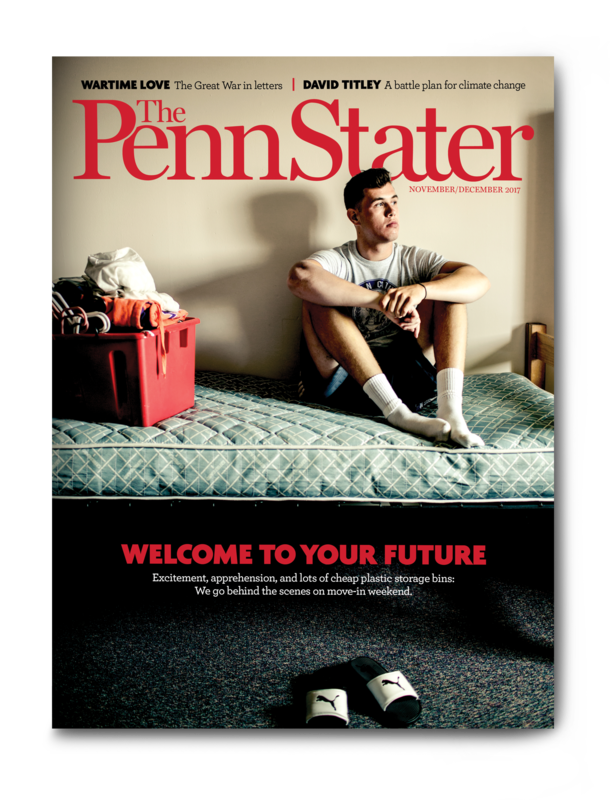 When you get our January/February issue, you’ll notice the difference right away, with a smaller page size, new binding, and a new font for our tighter magazine name (notice the missing “The” in “Penn Stater”). You’ll also see a beefed up and, we hope, livelier “Pulse” section, and some big photography spreads. 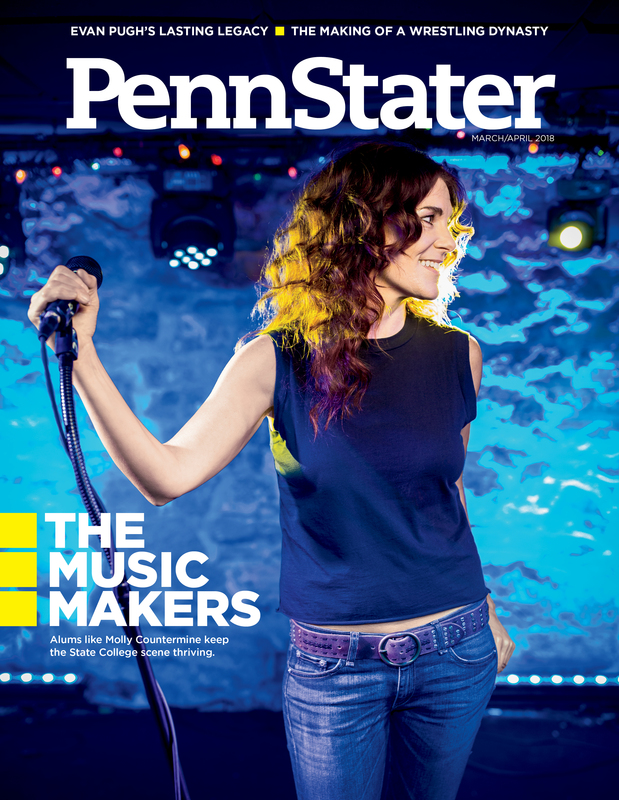 The changes in formatting and content extend throughout the magazine, but we hope that the quality of writing and the selection of articles is everything you’ve come to expect from the Penn Stater magazine. Let us know what you think of the changes at heypennstater@psu.edu. As far as what you’ll find in the issue, the cover story details the complicated legacy of Harry Anslinger. Although you may have never heard of his name, his imprint on 20th century American culture is hard to mistake. Anslinger 1915 was the first head of the forerunner to today’s Drug Enforcement Administration, the father of the drug war who battled cannabis culture and also took on organized crime. Michael Weinreb ’94 details his story. Elsewhere in the issue, you’ll find tales of love on campus. We asked for your stories of how it happened for you while you were here and what we got back were tales that were heartwarming, tender, funny, sweet, happy, and sad. And you’ll hear from Steven Levy ’74g, one of the nation’s top tech journalists, who discusses the promises—and perils—of today’s internet world. You’ll also find out why there’s an air traffic control tower (or not) atop Deike Building, get the original story of the iconic Comic Swap store downtown, and learn what former Nittany Lion basketball star Calvin Booth ’98 is up to in the NBA. Our Jan./Feb. 2018 issue should be arriving in mailboxes soon. Let us know what you think at heypennstater@psu.edu. Our Nov./Dec. 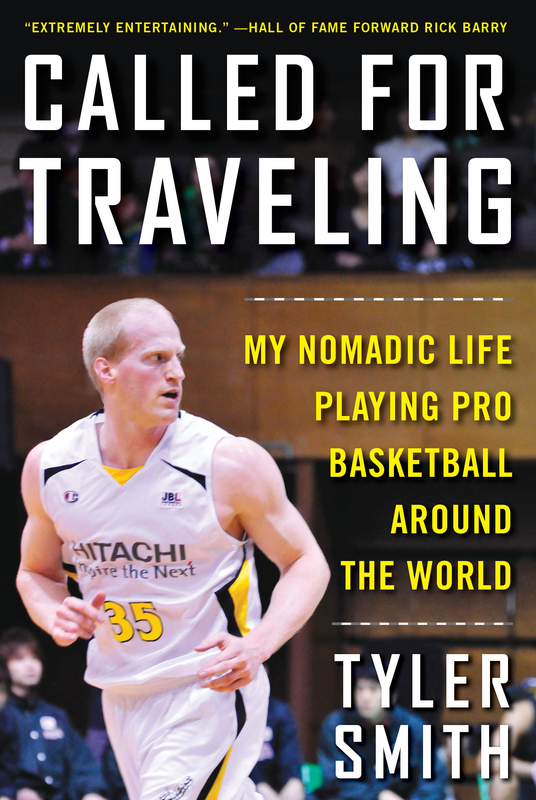 17 issue includes an item on a new book by former Nittany Lion basketball player Tyler Smith, who spent much of his career overseas chasing a professional basketball contract. As you might guess, the extensive traveling involved in such a venture could lend itself to stories, and Smith ’02 has some pretty good ones. He detailed most of them in emails home to family and friends—having to take toilet paper to away games, playing on odd surfaces, and 30-hour bus trips one way just to get to games. It all lent itself to a pretty good outline for a book. Still, Smith considers himself lucky to have had the experiences over an 11-year playing career. But the nomadic lifestyle is still in him: Smith has spent the past four years working as a medical device sales representative, still travelling across states to consult on medical equipment and prosthetic implants. Weigh-offs before a mixed martial arts fight have a reputation for lots of posturing, stare-downs and the occasional scuffle. School spirit, not so much. But before his January 2012 fight against Rashad Evans, light heavyweight Phil Davis ’08 stepped on the scale wearing a Penn State singlet, the kind he would have worn as a four-time all-American and 2008 national champion for the Nittany Lions. 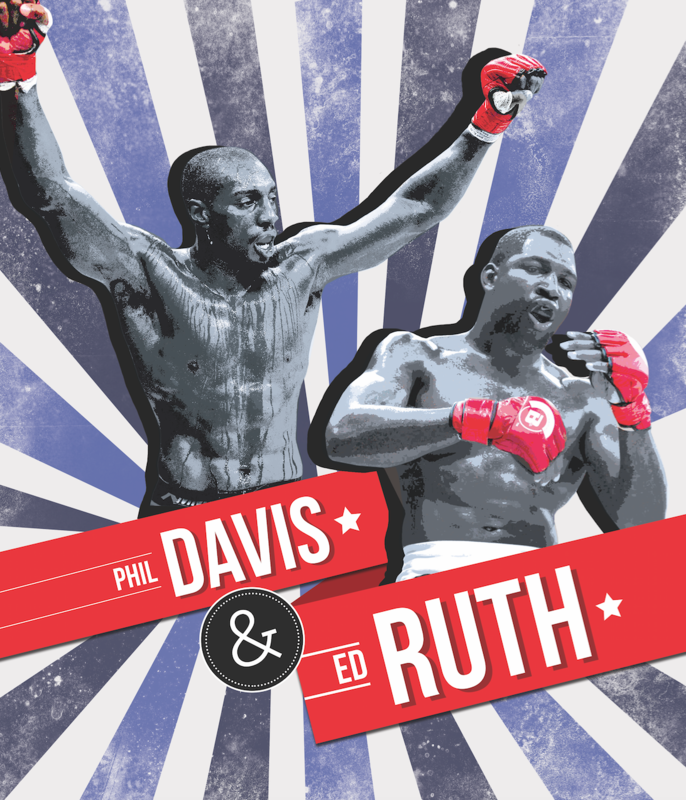 There’s more on Davis and Ruth and their transition to the MMA cage in our Nov./Dec. 2017 issue, already arriving in mailboxes. You may have come from thousands of miles away, or from the nearest town over, but nothing quite compares to arriving on campus for the first time. Whether you were nervous to meet your roommate, excited to be on your own, or sad saying goodbye to family and friends, most of us probably remember that day. We wanted to see what incoming students today thought of the experience, so we sent photographers to five Penn State campuses on arrival weekend to get up close with students—new and returning—and capture them in their element: suitcases, boxes, duffel bags, and lots of cheap plastic storage bins. The feature begins on p. 28. Also inside, we take you back to a time of great transition and tension in the world, and particularly on campus, as the college transitioned into a military training camp during World War I. The story is told through the love letters between Norman Lake ’22 and Helen Gladys Keller, his then-girlfriend whom he would later marry. Their story begins on p. 40. And you’ll meet David Titley ’80, a retired Navy admiral and atmospheric expert who has become a prominent voice on climate change as a national security threat. Plus we’ll take you to the scene of the first away pregame tailgate, hosted by the Alumni Association, and introduce you to Denis Smirnov, the Russian hockey phenom who turned down the chance to play in a top Russian pro league and the NHL to play for the Nittany Lions. Our Nov./Dec. 2017 issue should be arriving in mailboxes soon. Let us know what you think at heypennstater@psu.edu. 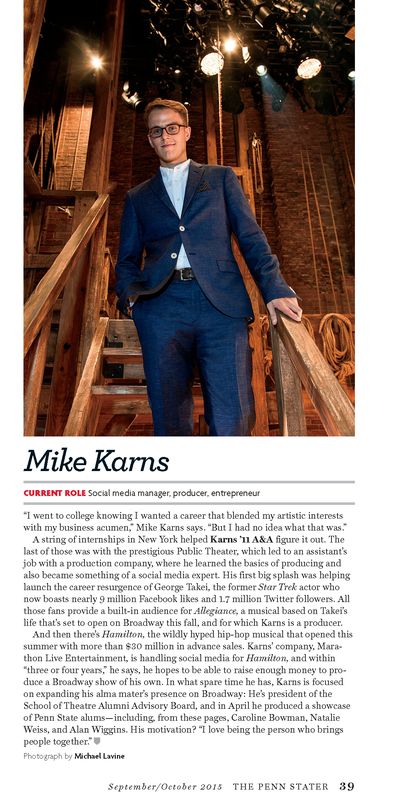 When we met Mike Karns ’11 for our Sep./Oct. 2015 feature on alums making their way on Broadway, his digital startup Marathon Live Entertainment was handling social media for small, off-Broadway clients, a few real estate agents, and was in the infancy of its current stint with a show that had just started its run on Broadway, Hamilton. And just as the “ten dollar founding father’s” star has risen, so has Karns’ profile. Today, he oversees a digital and social media empire for the Broadway phenomenon, which still plays to packed houses in New York City and has spawned a national tour. With tickets still in high demand, merchandising for the show has grown to include a mixtape, an instrumental soundtrack, and now a smartphone app—launched Aug. 11 by Karns’ company—that recently surpassed 750,000 downloads. His social media efforts have attracted more than two million followers. In addition to Hamilton, Marathon Live handles the digital marketing for a number of other Broadway and off-Broadway productions, and he himself has become a Tony-nominated producer, after having latched on as a co-producer with Natasha, Pierre & the Great Comet of 1812, a Broadway musical that has featured, among others, Josh Groban and Ingrid Michaelson. Away from Broadway, he’s president of the School of Theatre Alumni Program Group and a recipient of the 2017 Alumni Achievement Award.